In the last article on the P/E ratio vs. Growth for some of the largest companies, the question of PEG came up. PEG is the P/E over Growth and it’s a good way to index valuation relative to growth. Usually Growth is measured as the forward twelve months consensus and a PEG of 1 is, as a rule of thumb, considered “fair value”. However, forward growth is based on possibly inaccurate analyst consensus. If we instead look at historic growth, we have some actual performance to evaluate. Let’s call this PEhG for P/E over historic Growth. The chart makes for an interesting point of view over what the best positioned companies in the sector are doing and how business model innovation shows up as investment opportunity. Apple, RIM, Google stand out for their business model innovation. 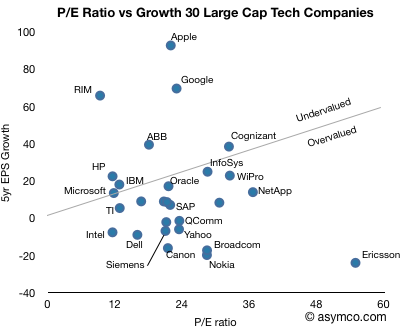 Ericsson, Nokia, Yahoo and Dell show poor value for their lack of innovation. Microsoft, IBM, HP, TI and Oracle show in-line value for in-line or sustaining innovation. I omitted Baidu from the chart as it’s off the scale: Growth is 151, P/E is 108. It would classify as undervalued. These are also not a complete set of all large caps. It’s meant to be indicative. Notions of value are completely subjective. This does not constitute financial advice.